Lymphocytes are small leucocytes with a round nucleus and a thin rim of cytoplasm. About 10% of the peripheral lymphocytes are large, have a more abundant cytoplasm that has granules. 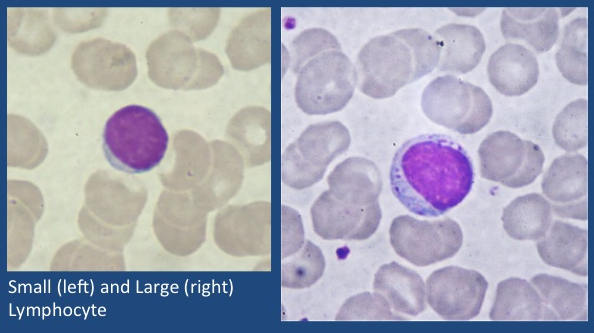 These are called large granular lymphocytes (LGL). About 85% of the peripheral blood lymphocytes are T lymphocytes. The remaining are B lymphocytes and NK cells with B lymphocytes dominating. Lymphocytosis is increase in the lymphocyte counts to what is normal for age. Lymphocyte count is highest at birth and falls with age. Normal lymphocyte counts in adults is 1000 to 4800 cells/mm3. Lymphocytosis may be reactive (see table below) or due to a malignancy. Reactive lymphocytosis is polyclonal. Lymphocytosis due to malignancy is monoclonal. The most common cause of reactive lymphocytosis is infectious mononucleosis due to Epstein-Barr virus infection. Reactive lymphocytosis may be seen in other viral infections, drug hypersensitivity, thymoma and after splenectomy. Persistent polyclonal B cell lymphocytosis is a condition found in middle aged women who smoke. Monoclonal B cell lymphocytosis and chronic lymphocytic leukaemia are the commonest causes of primary lymphocytosis. Clinical Picture: Patients with IM have fever, malaise, pharyngitis and other features of IM. Morphology of Lymphocytes: Reactive lymphocytes of IM show variations in size and morphology. Cells from patients with malignant lymphocytoisis are more uniform. Other infection: Atypical lymphocytosis is a feature of other infections listed in the table above. Typical features of the causative infection may or may not be present. CMV associated mononucleosis syndrome is indistinguishable from IM. Lobulated lymphocytes are a feature of human T-lymphotropic virus type I (HTLV-I ) infection. Lympocytosis with B pertussis: Pertusis caused by Bordetella pertussis with upper respiratory symptoms that evolves into a paroxysmal cough in about 1-2 weeks. Pertusis is an exception amongst acute respiratory infections in that it causes lymphocytosis rather than neutrophilic leucocytosis. Unlike other viral infections lymphocytes of pertussis are small and have cleaved nucleus. Stress Lymphocytosis: Stress has been associated with an increased lymphocyte count. Counts may range 4,000 to 10,400/mm3. All subsets of lymphocytes increase. The counts normalises after the stressful event passes (Am J Clin Pathol. 2002 May;117(5):819-25). Persistant Polyclonal B cell lymphocytosis: Persistent polyclonal B cell lymphocytosis is seen in young to middle-aged women who are smokers. The patients show the presence of large binucleate lymphocytes. There is polyclonal increase in IgM in the serum. The patients do not have lymphadenopathy and splenomegaly. Splenectomy: Lymphocytoisis that persists has been reported in patients who have undergone splenectomy (Clin Lab Haematol. 1995 Dec;17(4):335-7). Thymoma: Paraneoplastic T cell lymphocytoss may rarely be seen in patients with thymoma. The patients present with a mediastinal mass and lymphjocytiosis. They need to be differentiated from T Lymphoblastic leukaemia who can present with mediastinal mass with lymphoblasts (Ann Oncol 2007; 18:603-604). Hyperreactive malarial splenomegaly: Hyperreactive malarial splenomegaly is seen in residents of malarious areas. It presents with left upper quadrant pain, fatigue and dyspnoea. The patients have a massive spleen. The haemogram shows anaemia, leucopenia and thrombocytopenia. Some patients may have lymphocytosis. Monoclonal B cell lymphnocytosis: Monoclonal B cell lymphocytosis is a premalignant condition that has a risk of progressing to chronic lymphocytic leukaemia. It it is diagnosed in a patients with lymphocyte count <5000/mm3 without any other evidence of lymphproliferative disease. The morphology and phenotype of the cells is identical to that of chronic lymphocytic leukaemia. Patients are asymptomatic and the disorder is detected incidentally on a haemogram performed for another reason. Chronic lymphocytic Leukarmia (CLL)/small lymphatic leukaemia: Chronic lymphocytic leukaemia is the leukaemia phase of small lymphocytic lymphoma. Patients with CLL have lymphocytosis with normal looking lymphocytes. A few prolymphocytes may bee seen. If the percentage of prolympocytes is greater then 55% a diagnosis of prolymphocytic leukaemia should be made. The cells express CD19, CD20(usually weak), CD23 and the T cell marker CD5. Patients may have lymphadenopathy, splenomegaly and hepatomegaly. Anaemia and/or thrombocytopenia may co-exist, some of which may be due to autoimmunity. Prolymphocytic Leukaemia: Prolymphocytic leukaemia is a misnomer. The malignant cell is actually a activated mature lymphocytes. Prolympnocytic leukaemia may be of B cell or T cell type. The cells are twice the size of a normal lymphocyte. The nucleus is round with a moderately condensed cytoplasm. A prominent central nucleolus is present. The cytoplasm is faintly basophilic. Morphiology of T Prolymphocytic leukaemia is similar. Patients present with a high count (usually > 100X109/L), massive splenomegaly in the absence of lymphadenopathy. T PLL may show skin infiltration in 20% of the cases. They may also show serous effusions. Peripheral blood involvement with non-Hodgkin Lymphoma: Peripheral blood involvement with non-Hodgkin Lymphoma presents with mononucleated cells. Morphological features may suggest the type of lymphoma. These include villous lymphocytes of splenic marginal zone lymphoma and atypical hairy cell leukaemia, cells with cribriform nuclei in Sézary syndrome plasmacytoiod lymphocytes of lymphplasmacytic lymphoma and lobulated lymphocytes in adult T-cell leukaemia/lymphoma. Large Granular Cell Leukaemia: LGL leukaemia is characterised by a count of 2-10X109/L. The cell are large granular lymphocytes with abundant cytoplasm and fine and coarse azurophilic granules.